The Ableton Education Team met recently with Professor Karl Bartos at the University of the Arts in Berlin to discuss the university's new master's program, called Sound Studies, the professor's teaching philosophy, and the next generation of audiovisual media design. It doesn't take long to notice that the Sound Studies program at Berlin's University of the Arts (UdK) is new. Just wrapping up its first two-year cycle of classes, the department's white halls and classrooms still convey the look and feel of a freshly painted laboratory. The faint sounds of practicing musicians and classes can be heard reverberating from various parts of the building. It is here that Professor Karl Bartos and his small group of protégés are forging new paths into the next generation of audiovisual media. "At Sound Studies we are mainly interested in content," Bartos declares. "How the content is created, be it via a synthesizer or a computer program, is merely the means." While traditional audio programs tend to focus on specific audio tools, Sound Studies' focus departs from conventional teaching. But that doesn't mean the audio tools being used are not important. Despite the diverse backgrounds and individual working habits students bring to the Sound Studies program, one tool represents a common thread among most of the students. Bartos elaborates: "It simply isn't necessary to tell people that Ableton is important," he says. Regardless of where he performs, from Warsaw to Tokyo, it is simply a given that everyone is using Ableton Live. "For my students here at Sound Studies, Live is a common means of communication," Bartos adds. In his individual coaching of students, Bartos challenges them to explore new directions with their work, much as a producer interacts with an artist. "My job as professor is to focus on the work of the student and assist in formulating an artistic theme that can be embellished into a wide range of works," he explains. To illustrate his point, Bartos talks about his student Robert Heel. "Robert Heel belongs to a completely new breed of audio-visual artists who are neither trained musicians nor do they come straight from film school," he says. A media designer by trade, Heel's interests go beyond mere mashups to explore the rhythmic possibilities of audio-visual beats. To accomplish this, Heel uses Ableton Live as an integral component in his production process, aligning samples and applying effects to achieve just the right sound and rhythm. Bartos explains that he "focused on assisting Heel in developing a more contemplative sound," adding, "and with his recent work on the subject of water, I think he succeeded." Also under the tutelage of Bartos is student Sacha Robotti. Aside from his work as a DJ and music producer on his own label, Diskomafia, Robotti has undertaken, in his master's project, a rather difficult feat. Bartos elaborates: "In his newest project, entitled '128,' Sacha Robotti is dealing with the subject of copyrights and sampling in the digital age by attempting to create a mashup track with material sampled from 128 different copyrighted sources. He plans on getting permission from all of those sources." Robotti works with these samples using Ableton Live. "Because working with samples in Live is a very logical process, I was struck by the ease with which sampled material today can be manipulated and reused," says Robotti. "Not only is Robotti's work shaping up to be a great piece of music," Bartos adds, "it raises some important questions on the legal implications of what has become a very important form of musical expression, namely, the mashup." 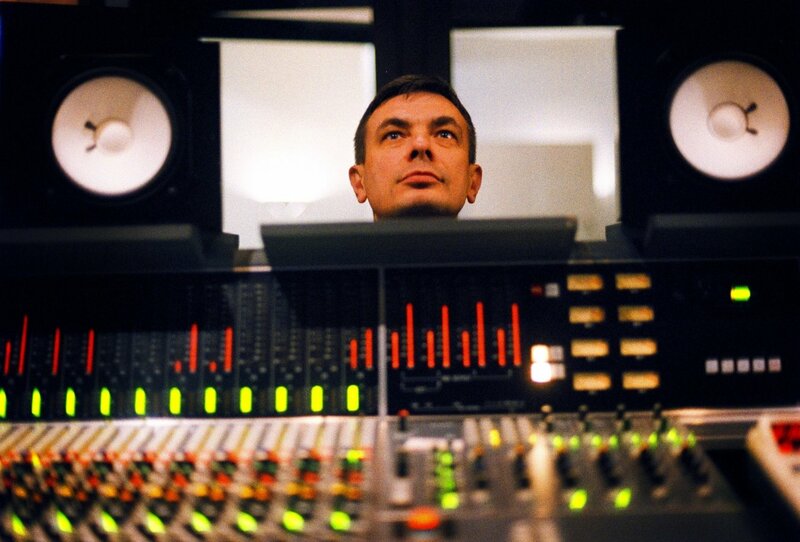 Hardly any other name in pop music is as synonymous with electronic sound as that of Karl Bartos. Originally a classically trained percussionist and keyboard player, he later became a composing member of the legendary German group Kraftwerk. Communication, the first album under his own name, was launched in 2003 at the Institute of Contemporary Arts, London (ICA), and has enjoyed international success. As a performer and musician, Bartos has worked with world-renowned artists including Lalo Schifrin, Michael Stipe, Björk, Malcolm McLaren, Ryuichi Sakamoto, Johnny Marr, Courtney Love, Yoko Ono, Kanye West, and Grace Jones. Apart from his work on his own label, KB Productions, Bartos is Professor for Auditory Media Design at the University of the Arts in Berlin.